Ryse: Son of Rome – PC – $9.99 + 512 SSD for $174.99! 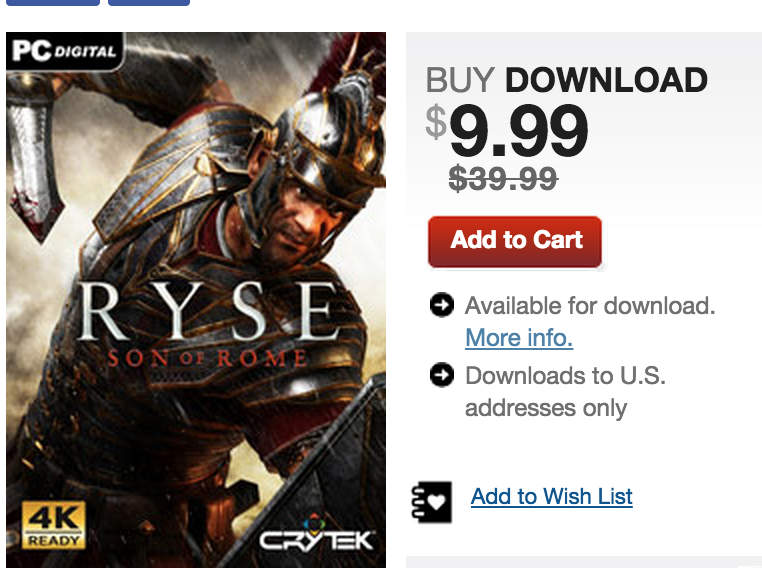 You are at:Home»DEALS»Ryse: Son of Rome – PC – $9.99 + 512 SSD for $174.99! Ryse: Son of Rome, originally released in October 2013 for PC and launched as an initial launch title for Xbox One the month after is now on sale as a digital download for $9.99 – only for the PC version. Ryse received mixed reviews, with Steam users giving it a 9/10 (perhaps the discounted price?) but overall received a Metacritic score of 61 – but hey not all critics are right, right? Head on over to Gamestop, link here, if you’re ready to get your hands on it, well this is a digital download, you won’t have a physical copy, also U.S address is required, and a Steam account. Another deal: if you’re ready to upgrade to a SSD, check this out! Newegg via eBay is offering 512GB SSD for $174.99 – remember when these use to cost over $1,000? Crucial MX100 has received nearly flawless reviews, with 4.5/5 stars from Amazon, and Techradar.